Flower Decorator in Delhi Flower Decoration is an important part of a wedding planning. If you are looking for an excellent and memorable flower decoration in Delhi, visit Delhi Online Gifts. Delhi Online Gifts is a professional Flower Decorator in Delhi. If you are looking for exotic wedding flower decoration in Delhi at affordable prices, you are at right place. A team of professional decorators is always available to help you make the event memorable for life. Delhi Online Gifts brings you a range of Wedding Flower Decoration in Delhi. Flowers are known for their elegance. They add freshness to the wedding environment. As bride and broom are going to start a new life, the flower decoration add romance to the environment. Contact us at +91-8826526700 or mail us at care@delhionlinegifts.com if you are looking for an exclusive Wedding Flower Decoration in Delhi. A team of flower decorators will visit the venue and suggest you the options for wedding flower decoration in Delhi. It's amazing what flowers can do to a wedding venue. Elegant, bright, full of lively vibe; fresh blooms can brighten up the reception area, ceilings, pandal and also the much important table décor. Every event of an Indian marriages starting from sangeet to bidai are unimaginable without flower décor. Be it a theme wedding décor or a signature wedding décor, flower arrangements and attractive designs add romance to the air. Delhi Online Gifts offers impeccable services with great flower decoration ideas in Delhi wedding venue. A wedding ceremony coming up right ahead in the family and no time to run around looking for an expert flower decorator in Delhi? Sit back and relax leaving everything to us. We create memorable wedding flower decorations in Delhi with the freshest and the nicest looking flowers. Covering wide spectrum of wedding flower and décor needs suiting all tastes and budgets, we are a team player that listens carefully and performs smoothly. You dream and we deliver! We don't need a year's planning to give shape to your vision. Give us a considerable reaction timeline to get all flower decors done from A to Z. Flower Decoration in Delhi is easier done with us than getting it done by a novice. Special décor style albums give a real time feel of the end effect. We have ready images for you to consider various options. That makes it easier to select what suits your taste. Our team is also open to your ideas and caters to all kinds of budgets. We adapt to flower designs keeping in mind the lighting and luxury fabrics used on the stage, overhead and on entrance ways. Our floral supplies come from the best local florists and we never run out of stock. Once you decide to involve delhionlinegifts.com for flower decoration in Delhi, all you need to do is call us at +91-8826526700 or mail us at care@delhionlinegifts.com. An expert team of professional flower decorators will visit the site and suggest options for wedding flower decoration in any location within Delhi. Photography is one of the ace points noted down on the 'to do' list in any wedding planning. Without an impressive back drop wedding photos can be really dull and boring. To add glamour, color, essence of freshness to the environ that’s no alternative to fresh flower décor. Delhi Online Gifts is highly professional and motivated to cater the best Flower Decoration in Delhi for customers. 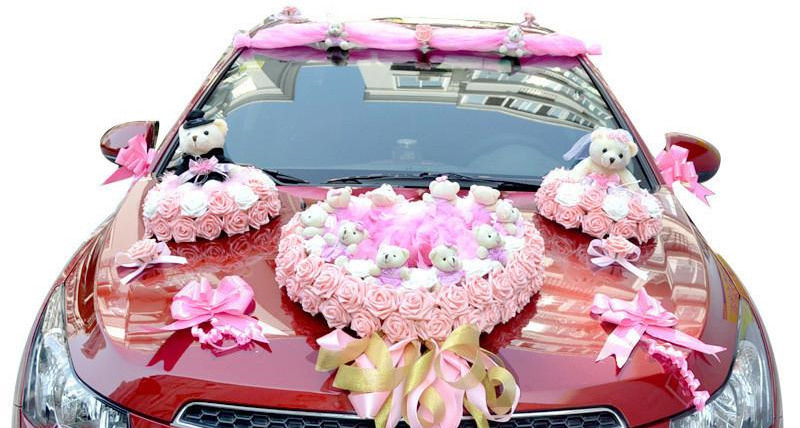 Wedding car decoration in Delhi is a much sought after service. The car in which the groom and the bride leave after ‘bidai’ has to look fabulous. Flower decorations along with fancy fabrics, soft toys and other embellishments are used to make car decors look additionally attractive. Delhi Online Gifts offer upbeat car décor ideas for lasting memories. Years of experience has taught us how to use the best resources to bring out artistic décor at an affordable budget. Big or small, we do all kinds of Car Decoration in Delhi.